The community has been screaming for haXe support in FDT. We are thrilled today to announce the public alpha release of the FDT haXe plugin! Developed in collaboration with Powerflasher and Influxis, the FDT haXe plugin provides developers a powerful tool for authoring the haXe multi-platform language. Our goal is to provide the best haXe coding experience and that it feels like coding in the AS2, AS3 or MXML editor of FDT: same shortcuts, same syntax coloring, same coding comfort. Watch the first live demo of the FDT haXe plugin I showed at Flash Camp Manchester in the recording from Adrian Parr starting at minute 38 here. Go to http://haxe.org/download and download the installer for your OS. Select “FDT haXe Plugin” from the plugin list, hit finish and follow the final installation steps. 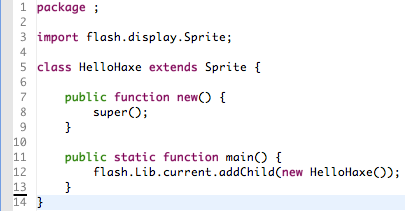 That’s it, you’ve successfully set up your first FDT haXe Flash project! Please note, the SWF is compiled on every Save, no specific launch configuration is available yet. This is our first Alpha release, please bare with us ! For any feedback, feature requests, improvements, bugs and other issues we encourage you to use our community driven tracking website to make the haXe support in FDT the greatest ever. We would also advice to subscribe to the haXe mailing list, it is a very active group with smart people and interesting topics. This is definitely step in the right direction, if it will be fully functional with all the bells and whistles i will go and buy FDT even when i just bought the Flash Builder Premium edition. Since i do work with haXe quite a lot using Flash Develop but its just not good enough. This is awesome. I’ve been using it for the entire day. This is much easier and faster than using a text editor and command line compiling. I’ll be talking to my employer to get an FDT license for sure. Hi Michael, I’m fairly new Haxe myself but if I think of anything I’ll log it. @Fintan No way to add compiler args yet. What do you think about the “compilation on save” strategy we have right now? We definitely need a Launch configuration where you can set the Player/Viewer. We could also add compiler args options to that launch config. Would be nice if you could log your ideas and thoughts about compiler args to the Jira Tracker (link above). Is there a way to add Haxe compiler arguments? Very big thumbs up guys. I didn’t really believe this plug-in was going to be released when I first saw it on the FDT4 roadmap. as the language and the compiler are dope! Le genre de nouvelle qui fait vraiment plaisir. 🙂 Annoncée sur le blog de FDT, en collaboration avec Influxis, l’équipe de Powerflasher vient de rendre publique une version alpha d’un plugin HaXe….